Fig. 4.1. 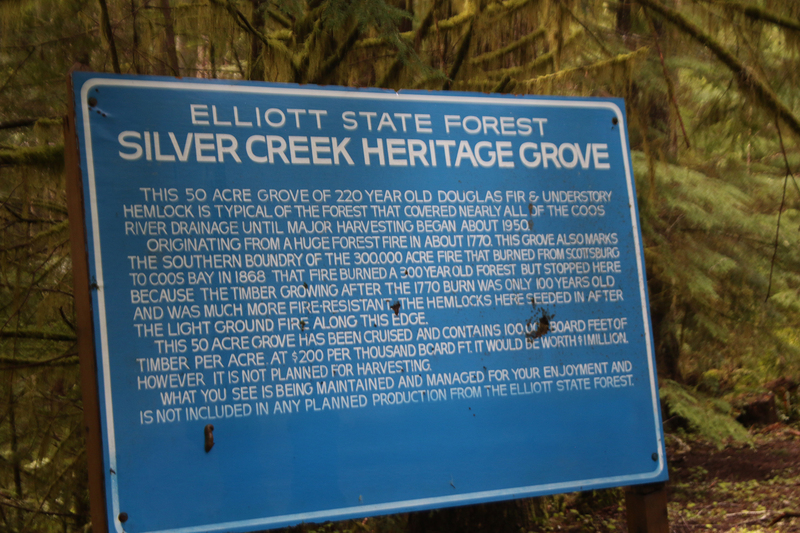 Historical Marker for Silver Creek Heritage Grove. Photograph by Anne Farrell-Matthews, April 17, 2018. The Elliott State forest has a total of 93,000 acres and more than 90% of it is owned by the Oregon Common School Fund. The Oregon Department of Forestry manages the land for the Oregon State Land Board, composed of Oregon’s Governor, Secretary, and Treasurer. The Elliott has produced over 284 million dollars for schools since 1955. Oregon established the Elliott State Forest in 1930 and named it after Oregon’s first state forester, Francis Elliott. Another major historical site is the Elkhorn Ranch homestead. The ranch was owned by the Gould family: “George Gould and his family moved in to this very wild, lonely country in 1886, from Elkton. Actually, they built their very first small cabin late in 1885 and moved in the following year”(Phillips 1998: 381). The Gould family moved in only 18 years after the big fire and built their homes and lives around the area we now call the Elkhorn Ranch. Potential for School Trust Advantage would go as far as charging access and parking permits to get into these historical areas and making sure that people pay the fees required. Donations from local organizations and businesses would be another way to fund these recreation areas so that users may not have to pay the fees and feel burdened. Barriers for development for these recreational use areas would be the funding to be able the afford and manage the use of the sites; also, how hard would it be for the average person that doesn’t know much about the area be able to access and find the location in the middle of the Elliott State forest. Also, how many people are projected to visit the area is another barrier we face due to not being able to guess how many people will visit the recreation site once it’s complete. We recommend that if the Elliott is to become a recreational area that the best way to make money off of it is to charge a site fee or parking fee when visiting the area. If at all possible local donations become an option to help pay for the management and use of the site. Donations would be the best option so that every person can afford to visit this area. According to Oregon State Parks 18,226 people visit Golden and Silver falls yearly; we think that potentially one tenth of them will visit our site. At five dollars a parking pass that would project an income of $9,113. Pre-contact – The Forest belonged to the Indians before early settlers arrived. The land was used for the survival of the Pacific Northwest tribes. Ethnobotany was a major key to survival of the Coos, Lower Umpqua, and Siuslaw Indians who lived in the Forest that is now known as the Elliott State forest (Phillips 2016: 1-126). 1850-1930 – The 1st settlement in 1850 was at Mill creek. Oregon became a state in 1859. A historic fire burned 300,000 acres and most of the Elliott State forest in 1868. Deans Mountain lookout tower was established in 1914 (Phillips 1998: 1-15). 1930-1940 – The CCC’s began to build a county road through the forest in 1933. Cougar Pass Fire Lookout was established in 1935. 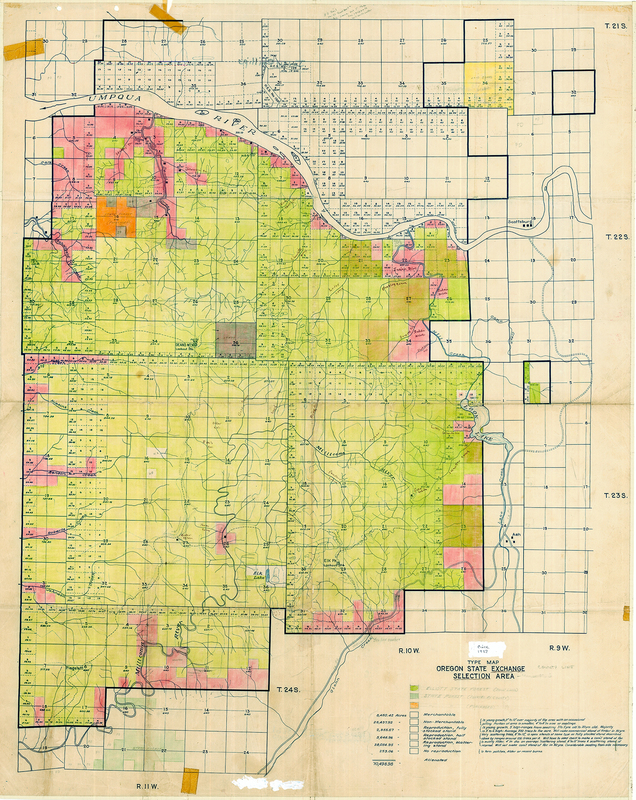 County deeded land to the State Board of Forestry in 1940 (Phillips 1998: 16-36). 1940-1962 – A big windstorm hit in 1951 in December and on Columbus Day, 1962. In 1955 the big forest inventory project was established. In 1957 Jerry Phillips helped prepare for timber sales but timber inventory was his main job (Phillips 1998: 138-190). 1962-1990 – Northern Spotted Owl became major issue in the logging industry. The Elliott State forest was actively managed and used for school funds (Phillips 1998: 112-137). 1990-2018 – The Endangered Species Act was created and put in to affect to help protect endangered species. Legal issues and logging regulations were changed to meet environmental sustainability. The Habitat Conservation Plan (“HCP”) was approved (Phillips 1998: 359-386). Map 4.1. Historical Map of Elliott State Forest, ca. 1930 (Jerry Phillips Collection).